Spinning Spinning reels are the more commonly used reels. They are basically easier and cheaper than the baitcasters. There are many variations of the spinning reel, including rear drag, and Shimano’s famous baitrunner to name a few. There is the added advantage of having removable spools so that you can use different line for a different purpose on the same reel. Baitcaster Baitcasters are basically used for accuracy and strength. The sizes range from the small for lure fishing to the larger ones for big game fishing. Casting is considerably harder, and they are mainly used on boats, hence, I have no baitcasters myself. What to look for in a fishing reel? Bail Arm: This part of the reel is the first point of load on the reel, so it must be rock solid. Check out the make of it to ensure that it is robust. Support Arm: Another part of the reel that takes a beating when a decent fish is on. Make sure it is made of some solid material and not hollow. We have had a cheaper model snap here on us! Spool: Choose a reel with an aluminium spool. Nowadays most reels are aluminium, but if given a choice, go for the aluminium. 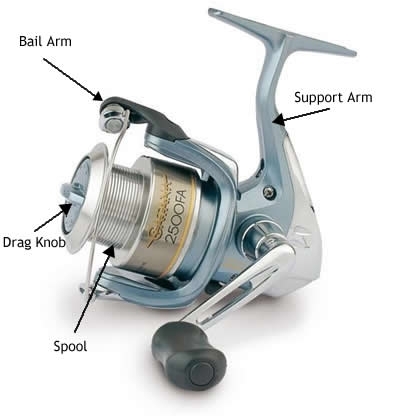 The spool affects the reel in a few ways, including casting and general wear. Bonus would be to have a spare aluminium spool included. Drag: Probably the most important aspect of the fishing reel. The drag is used to adjust the tension as to keep the fish on. If the tension is too tight, a larger fish will snap your line (or pull your rod in to the water!). If the tension is too loose, this gives enough time for the fish to shake the hook loose. What you need to look for in a good drag system is precision. This is easy to test. Loosen the drag knob and twist the spool with your hand anti clockwise. You will hear a clicking noise. Continue to tighten to knob and twisting the spool to check the drag at different tensions. The cheaper reels will be either very loose or very tight.